Hello, everyone! Inge here again. 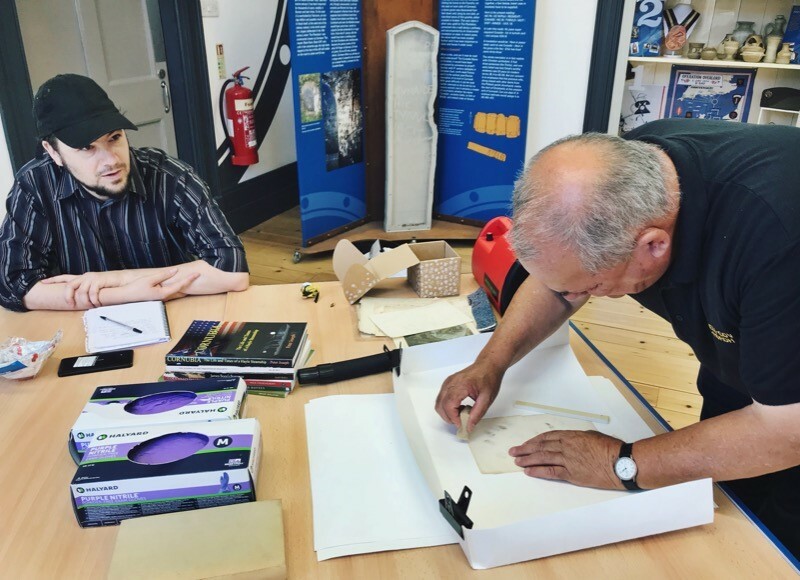 After a long break I am back to tell you about some recent events that will help us to deal ourselves with more complicated conservation problems that we will come across in the Biggleston Collection and others at the Heritage Centre. 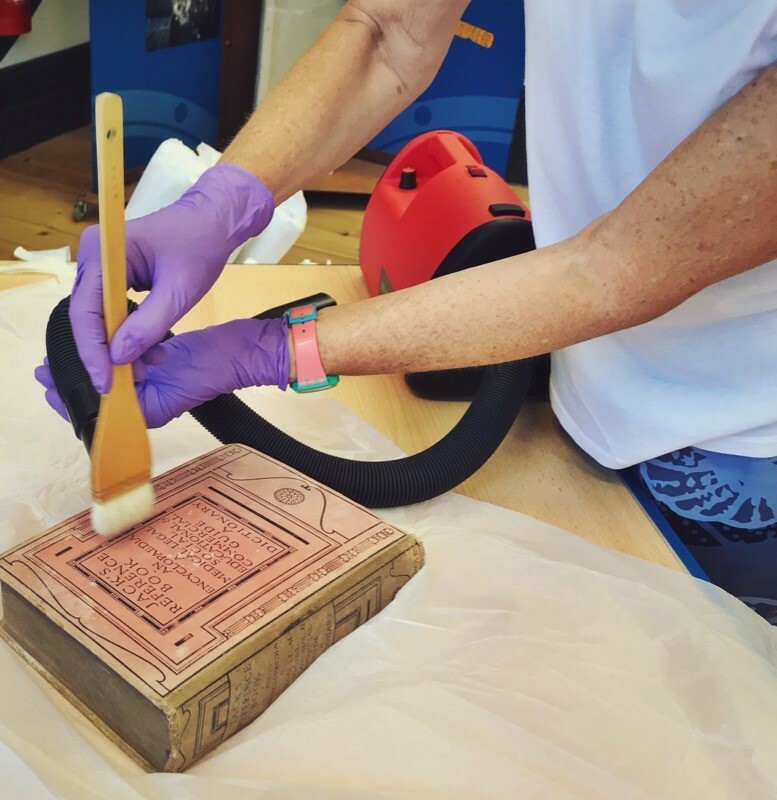 As mentioned in previous blogs, the collection was in a desperate state and we have been lucky to have the help of PZ Conservation teaching us how to conserve the documents. Over the last two years Keira and Hollie came on several occasions to run training days which then enabled us to do most of the repairs ourselves. But there is a lot more to learn about conservation. 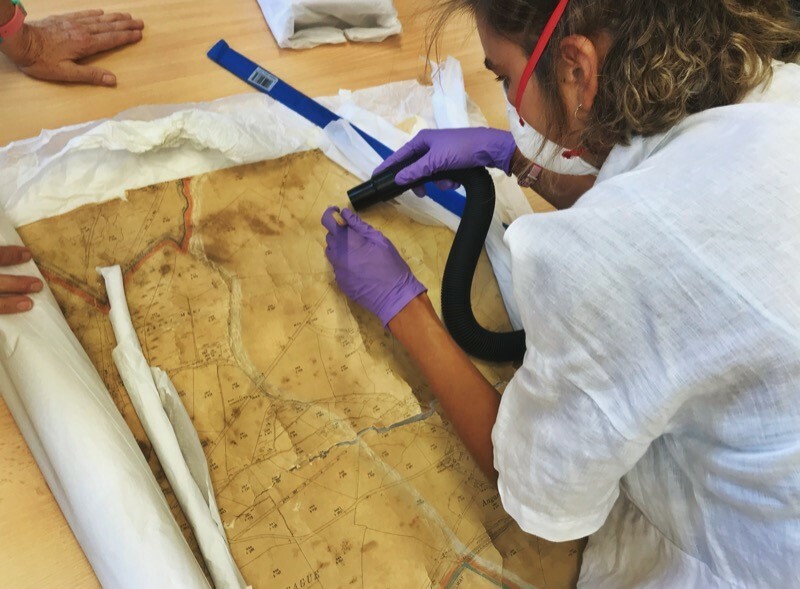 So on the 18th July Hollie from PZ Conservation came to the Heritage Centre to show us how to deal with a collection of historical OS maps which were mouldy and in bad repair. She had previously taken the maps back to the studio where they were put in an ordinary chest freezer “misused” for freezing to death hidden little critters in books and documents and deactivating mould at a temperature of minus 25 degrees Centigrade for about 4 days. This will unfortunately not completely kill it. It is therefore important to store collections in conditions that do not allow the mould to spring back into life. We therefore monitor our storeroom to ensure the temperature and relative humidity are in line with recommended levels. She carefully unrolled the maps, weighed them down at the edges and with one hand, using a soft flat brush made of goat’s hair, gently brushed the map systematically to loosen the mould residues. The other hand was holding a small conservation vacuum cleaner sucking up the dust. The suction power was very, very gentle. Do not do this at home, your average vacuum cleaner would be far too vicious and your precious document would disappear up the tube which obviously is to be avoided. Hollie demonstrating how to properly use a Museum Vac® on fragile paper objects. Then it was our turn. Trevor had a go at cleaning a document using a smoke sponge which will rub off some more of the remaining dirt and I did a practice run at cleaning a book cover using the brush and vac. Fellow volunteer Trevor cleaning the maps using a smoke sponge. Here’s me using the Museum Vac® and hake brush on a dusty old encyclopaedia. We did not do any further repairs to the map that morning. The method would be the same as repairing the documents of the Biggleston collection using Japanese tissue of varying thicknesses and wheat starch, but thanks to the training by the wonderful girls at PZ Conservation we know how to do that and are looking forward to getting stuck into the collection of mouldy maps. And that was yet another thoroughly enjoyable training day. Why was school never like that?